Low Fat Kefir 32 Oz Kefir is a tart and tangy cultured milk smoothie that is high in protein, calcium and vitamin D. Thanks to our exclusive blend of kefir cultures, each cup of kefir contains 12 live and active cultures and 7 to 10 billion beneficial probiotic strains. 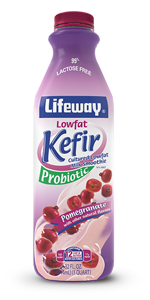 POMEGRANATE Lifeway Kefir is a tart and tangy milk smoothie wth 12 live and active probiotic cultures. Gluten-free, 99% lactose-free and made with all natural ingredients, it’s a protein and calcium-rich drink perfect any time of the day.